Found in Aptos, California, USA. Two nested A's and a 72 below. Clear glass. The "large H over the small A" mark is one of the most common mis-identifications. The emblem was used by the Hazel Atlas Glass Company and not Anchor Hocking." 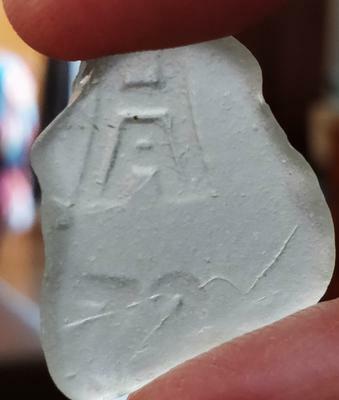 That’s actually the Anchor Hocking glass company logo. The top one is and H. Interesting find. Join in and write your own page! It's easy to do. How? Simply click here to return to Identify Your Sea Glass.